If you’re in the market for a new RV and have been itching to get out of the house, then head on over to our RV dealership. We’re delighted to offer you a huge selection of RVs for sale during our Spring Thaw Sale. Happening now through March 18, this sale is a great opportunity for family fun. We’re offering discounts, food, and of course RVs. Join us from 8 am to 5pm. Make memories with your family, meet our sales team, and learn about RVing from both fellow RVers and our team. There’s no better way to beat the winter time blues than by stopping by and beginning to get an idea of what’s available to you and how much fun you’ll have. You can get discounts on parts, including $10 off a purchase of $75 or more and $5 off a $25 purchase. Chat with our experienced parts team to learn more about what is available and don’t forget to use those coupons for a great deal! 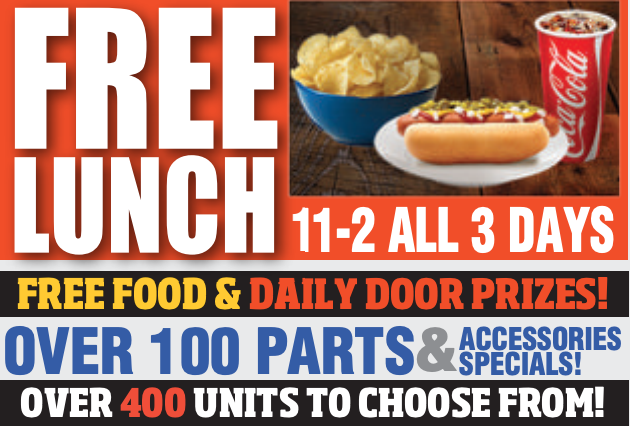 We’re offering a free lunch from 11 am – 2pm all three days. Grab a drink, hot dog, and chips and chill out with the family while you browse our extensive selection of RVs. Our selection of RVs for sale during this sale is too extensive to list here. Check out our flyer to see everything. One of the most popular model available is the lightweight Wolf Pup 16BH. This floorplan offers bunks at the rear and is a great option for families looking for a lightweight travel trailer. We also have 2019 Winnebago Intent motorhomes. These RVs feature a spacious rear bedroom and a lovely living room at the front of the RV that boasts space for the entire family. Whether you’re looking for a travel trailer, motorhome, or fifth wheel, you can rest confident that our selection will have something that appeals to you. If you’re interested in learning more about our selection of RVs for sale during our Spring Thaw Sale, contact us. We can answer any questions you have and make sure you’ve got the information needed to make the best decision for your needs. We can also assist with RV financing and help you plan your RV vacation.